This neighbourhood template is AEM3. To install, place the required CC folder in your Downloads, and the AEM3 folder in Bon Voyage/TSData/Res/NeighborhoodTemplates. Some tweaks were made to the landscape, but it is basically Flabaliki's, used by permission. Thank you! Created in AnyGameStarter using all EPs and SPs, except the Holiday packs. The entire hood should be visible with the default camera. Contains no playables, tourists or locals. All lots have been tested extensively in a separate environment. This neighborhood can be installed in place of Three Lakes or alongside it. If you want to install Boldrewood as well as Three Lakes, and want automatically-generated locals, note that only the first vacation subhood of a type (Mountain, Asian or Tropical) will generate them properly. 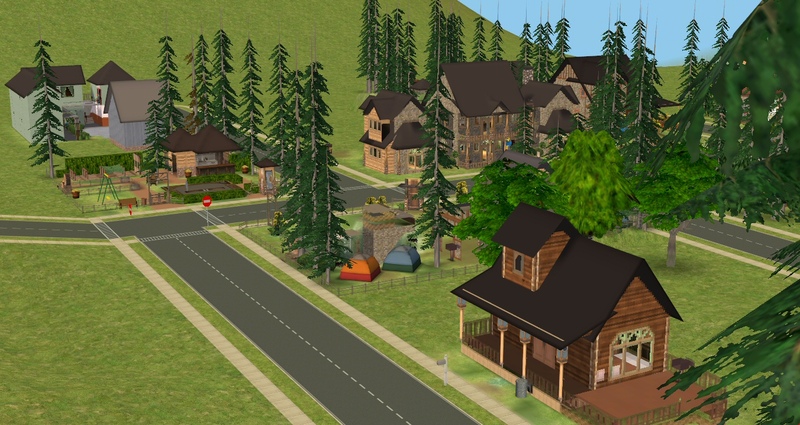 Later subhoods of the same type will be empty, but contain junk references to the missing sims. The same happens with multiple Downtowns. See this thread for a workaround. If you are using empty BV templates, no vacation sims will be created anyway. You can create your own - see this thread for instructions. Minimal CC is used in the hood. There are custom modular stairs, which require not only the package file, but also a text file to be installed. Using Numenor's Scriptorium is the easy way to get this right. There are 19 lots included. All have flat edges, except for the secret lot, which should not be moved. All lots have a pool tile (often concealed under something) to enable Voeille's "Pond and Sea Water Overhaul". Every lot has toilet facilities and some source of food. There is only one cash register per lot, regardless of how many shops there may be â€“ this prevents excess NPC creation. Feel free to add more registers if you want them. There is space to add extra lots if you wish. 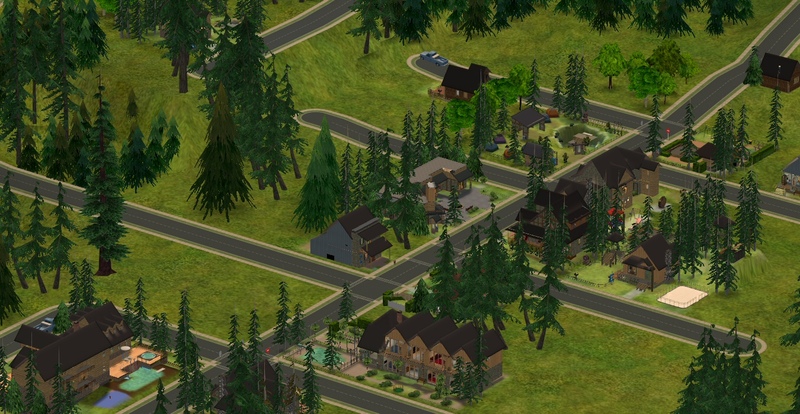 A number of the lots in this hood have been altered using Mootilda's LotAdjuster. If a lot has walls closer than two tiles from the edge of the lot (the Minis, for example), the walls and roof should not be deleted, as the game will not let you rebuild them. If you want to move the roof or walls on an altered lot, you will need to use the LotAdjuster to do so. Make a copy of the unaltered lot before beginning, in case something goes wrong. Decorating is not affected, so paint things however you like. 5 Vacation Homes to buy. (If you want to modify it, enter the cheat: loadlot "AE Hidden Burrow"
Boldrewood requires some custom content to look the way it does in the pictures. Creator policies have been checked - many thanks to all of them! Selected items from Chrissy6930's Mountain Build sets 01, 02, 03. 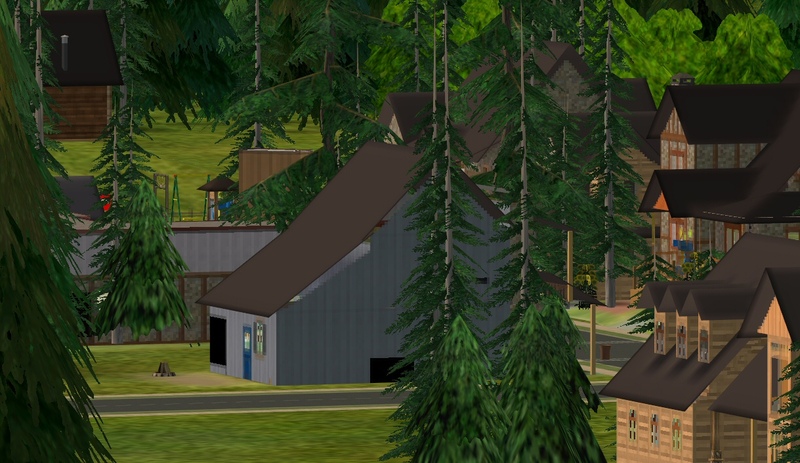 No longer easy to find, as the site (ts2creations) closed long ago. -Text file needed for the open stairs only. Chrissy6930's Pinegultcher Stairs in Mountain Wood. Text file included. Two-in-one Roller & Ice Rink (9x7), by Natalya. 38 people have said thanks to aelflaed for this download.